Yesterday I had dinner with Yuji Kogure, Quest Videos CEO, and we spoke about the importance of History to understand what is the Bujinkan. The Tsurugi was a major step in our training as it linked the ancient past to the modern world. Since Sensei explained that the Tsurugi was the origin of the Sanshin no kata, we were able to link the evolution of sword warfare: Tsurugi, Tachi, Katana. The Tachi created during the Heian period (end of 10th century) was “en vogue” during the warring states period. The use of the Tachi lasted, more or less until unification was completed by Tokugawa Ieyasu after his victory at the Battle of Sekigahara (1600). And they came up with a simple answer: they invented taijutsu! On the battlefield, a soldier always has weapons, unarmed combat (even in today’s armies) is therefore very rare. What they did was stripping the battlefield techniques of the Yoroi and weapons, and teach them as Taijutsu to the future samurai. 3. And if kids had a Yoroi fitting their body, they would not be able to learn the forms because of the weight. So what we call taijutsu today was in fact battlefield techniques mimicking the movements you have when wearing the Yoroi and the weapons. I’m sure that many of you wondered once why some of the waza do not seem “logical”? They don’t seem logical because they are missing the Yoroi and the weapons. Since last year, I have revisited many waza with Yoroi and weapons (sword in the right hand and Yari in the left), and I understood a lot. The apparent lack of logic in them vanishes when you are wearing the full equipment. In my dōjō, we always have one or two students training with Yoroi, and the benefits are amazing, even to the observers. If you have a Yoroi, please use it, don’t let it rust in a corner. Use it and you will be surprised to see how the Yoroi can teach you correct taijutsu and proper footwork. 1. Densho are made of sets of simple techniques because they are designed for kids. 2. Waza are fighting techniques simplified to prepare the young samurai to enter the battlefield. 3. Taijutsu was invented for that purpose. What we do in the dōjō reflects this evolution. But if you want to improve your skills, you have to study what I consider to be the foundation of our art: those four centuries of warfare that created our techniques. This reason is why I consider History to be so important. Teachers, please teach Japanese history during your classes. 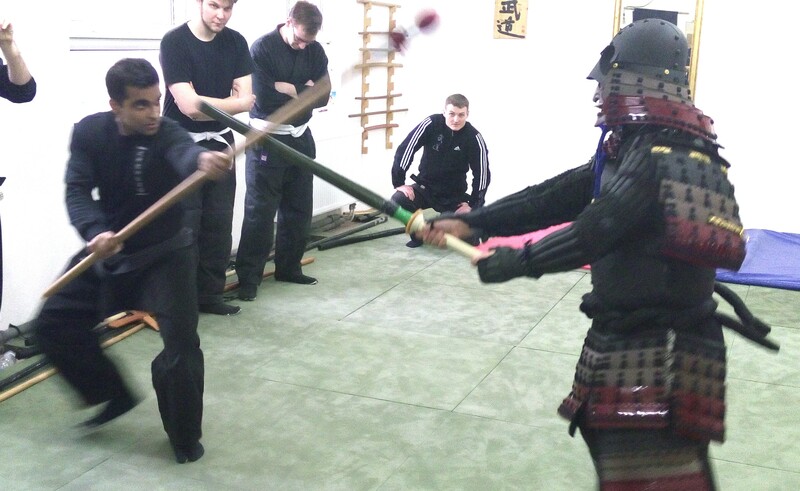 It will help your student improve their skills and also understand why the Bujinkan is not a sport. Yes there should be no class without some reference to history, it is ever relevant in all that we do in Bujinkan. You already have said it Yoroi! Our Taijutsu doesn’t live without that reference and feeling!